Personal training helps you achieve results more quickly, learn new skills and gives you a trainer to work with your specific health requirements. How often do you get time to focus on yourself? One on one sessions allow you the time to do just that, a time each week where you get to concentrate on you. Yay! Emma is a supportive and encouraging trainer who gives you her full attention. Conveniently located in Auckland CBD we offer sessions before, after and throughout your work day. 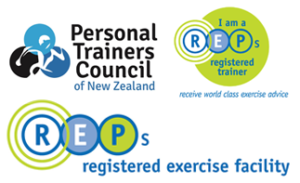 Emma is a REP's registered and delivers quality training sessions designed around you and your needs. We understand that it's often hard to get motivated and can be intimidating making changes. Emma takes into account your readiness to exercise each day and tailors that session to your needs that day. We want to ease you into connecting with your body and finding the joy in movement. Our consultation takes 60 minutes, Emma takes a detailed look into your goals, health and injury history, records your blood pressure, works through a movement appraisal and a structural assessment.